A lauded titan of French letters plumbs the intersection between character and despotism in a slender, tendentious imagining of a conversation between Napoleon and a trusted political ally. 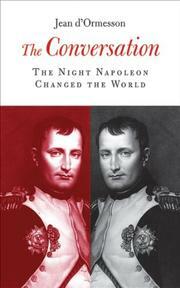 On a winter evening in 1804, Napoleon seeks the advice of Second Consul Jean-Jacques Cambacérès at the general’s Tuileries residence in Paris. The two men ponder the fate of the fledgling French republic, sapped by years of bloody revolution and foreign wars. D’Ormesson formats his story as a one-act play, with both men ruminating on the merits and flaws of democratic government as well as history’s cruel, unexpected turns. “I don’t repent the Revolution,” Napoleon confesses, “but I always detested its crimes.” He carefully builds a case to the wary Cambacérès: What conflict-weary France needs is a modern Caesar, bursting with ambition, burning to rule his country by any means necessary. Although a political parable, the book espouses elitist notions that would fit beautifully among today’s continental intellectuals. “The future belongs to no man,” Napoleon says, “Still, I am trying to bend it to my will...I am called to change the face of the world.” Once Cambacérès capitulates to the general’s bulldozing arguments, Napoleon feels liberated to crown himself emperor in the Roman fashion, revealing a profound narcissism that will both elevate and undermine his pivotal role in shaping Europe. While Bent’s translation is fluent, there’s a larger problem: d’Ormesson resists other options to Napoleon’s Great Man of History theory. “Successful men of letters think themselves the center of the world,” Napoleon audaciously claims; and it’s easy to believe that d’Ormesson, too, espouses this view.